Few full-length animated feature films have managed to capture the collective imagination of a generation than the Toy Story franchise has. Sure there have been numerous animated classics that have been embraced by their own generations, but few are as far-reaching in terms of market impact and universal appeal as this Pixar creation is. Let's take a closer look at the massive hit and the sequels that it spawned. Toy Story was released to worldwide acclaim in 1995, and audiences all over the world were drawn to its totally CGI execution. In fact, Toy Story is the first full-length feature film to use CGI exclusively. The film focused on the friendship between two toys: a cowboy named Woody and an astronaut named Buzz Lightyear. The animated characters relationship with Buzz Aldrin isn’t clear as the astronaut has said that he hasn't received any compensation from anyone for the use of the name Buzz or the astronaut characterization. Toy Story 2 was released in 1999, and it was also a fully CGI film like its predecessor. 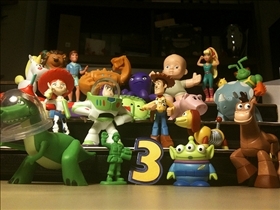 In addition to Woody and Buzz, Toy Story 2 also featured a host of new characters in addition, to the other toys in the first movie. John Lasseter, who directed the first installment in the series, also directed Toy Story 2. As for Toy Story3, it is the third and final installment in the series, and it is slated for showing in June 2010 in the United States and in July in the United Kingdom and Ireland. Former Toy Story 1 and 2 editor and Toy Story 2 co-director takes over directing duties for the 2nd sequel. Much of the action in Toy Story 1 revolves around Buzz Lightyear and Woody, which are voiced by Tim Allen and Tom Hanks respectively. The movie also featured songs by Randy Newman. Toy Story 2 retains many of the same characters as the first movie, and adds a host of new characters voiced by such celebrities as Joan Cusack, Kelsey Grammer and Wayne Knight. Toy Story 3 still features the Allen and Hanks voiced characters Buzz and Woody, and also includes voice performances by Joan Cusack, Don Rickles, Estelle Harris and John Morris among others. Toy Story 1 was a certified box-office hit, grossing more than $39 million in the first five days of its release. Toy Story 2 made even more than that in its first 3 days, and it is in fact the third highest earning film of 1999, surpassing even the first movie. The box office performance of Toy Story 3 is yet to be seen, but it is expected to be a smash hit as well. I am not a kid anymore but still going to see Toy Story 3 tonight. I grew up watching Pixar movies. Check my Pixar favorite ranking. Good luck for you dude with your idea. I love to enjoy reading your post. Thanks anyway. Robin Hood vs. Zorro: Who are they? 3 Idiots vs. 5 Point Someone: Which is better?